All payment is non-refundable. Guest must pay in full for all reserve number of guests. FEELS AT HOME WHEN YOU ARE AWAY (while you travelling). Hey hey, Welcome to Brunei! If you are looking to make friends, feeling homes even just for a night - CO.LIVING Hostel is your place. We want you to feel at home the moment you step in here. Great laughs, never ending stories and games, meeting new travellers friends - you will feel just right in here! Hot showers, complimentary tea and coffee, laundry service, FREE wifi (with limited quota)- couch, sofa, bar table we got you covered, making sure you have a pleasant stay! 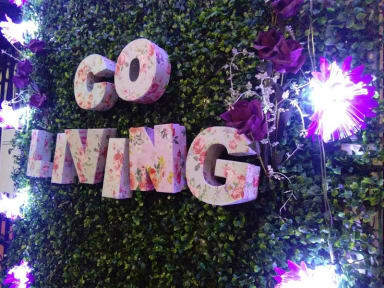 Co.Living Hostel is located right in the heart of Gadong town, 10-15 minutes walking distance to the mall, Gadong. Near to the mall is the popular night market (GADONG NIGHT MARKET) - where you can grab almost everything for $1! The Bruneian foodies! The hostel itself is located above a restaurant, just go downstair to have Brunei popular 'NASI KATOK' for $1.50 or lunch at Al Akhbar restaurant for $1-$2! Yup, it is delicious and cheap! Travellers/Backpackers can expect an easy access around town - shops, restaurant, clinics, ATMs and BUS STOP is just 5 minutes away. FREE Wi-Fi, good stay experience in a fully furnished room. The hostel is decorated with green turf and LED lights, and all rooms are equipped with air-conditioned. Guests can use the kitchen for light cooking’s. There are 2 dormitories with 4 single beds respectively and two private rooms. Two bathrooms are available where we always make sure it is being clean everyday. The hostel is in a very strategic coordinate of Gadong. Co.Living Hostel is managed by PayGlass Company Sdn Bhd.